Granta Design has announced Lamborghini as the keynote speaker for its Automotive Material Intelligence Forum. 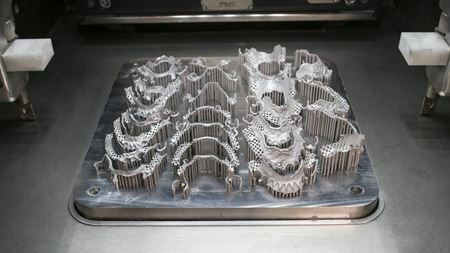 Renishaw has partnered with an Australian dental laboratory to install the first metal additive manufacturing machine for dental applications in Australia. Sigma Labs Inc has entered into an agreement with the US National Institute of Standards and Technology (NIST). 3D printing company Renishaw has been presented with an award for IT in India. Shane Collins, general manager at Additive Industries has received the ASTM Award of Merit. The US Office of Naval Research has awarded a research and development non-profit a contract to improve the quality of 3D printed metallic parts. Applied Graphene Materials, which makes graphene materials, is pleased to announce its interim results for the period ended 31 January 2018. Lufthansa Technik will become part of the maintenance, repair, and overhaul (MRO) network for LEAP-1A engines. The MPIF says that its annual Basic PM short course will return in 2018 and registration is now available. Rodney Brennen, VP of PM parts company Metco Industries, has been appointed president of the Powder Metallurgy Parts Association (PMPA). Michael Stucky has been appointed president of the Metal Injection Molding Association (MIMA). According to its recent survey, 96% of ceramics acompanies are planning to increase their total investments in the coming year.